In reflecting on my first six months on the job, I thought it would be helpful to share one of the most valuable skills I have learned and am continuing to develop at work. That skill is project management. 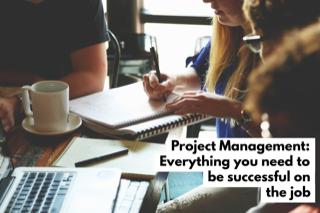 Effective project management is not only crucial to the success of your work, but it is also crucial to your professional brand and reputation. It is important to develop this skill early on in your career, because you do not want to become known as someone who cannot deliver on or manage the expectations of your stakeholders. Effectively executing on projects not only makes you more productive, but it also helps you build your credibility in the office. I have collected some tips from my managers and mentors at work and have put together a three step methodology to ensure project success. In order to do a project well, you must first understand its objective and the work required to reach that objective. For me, this meant that I had to start asking a TON of more clarifying questions. As young professionals, I think we are sometimes reluctant to speak up in a meeting or ask questions right there on the spot, because we don’t want to appear confused or incompetent. However, you have to get over it and push yourself if you want to do well. If you start building good habits early, you will maintain them throughout the rest of your career. Some of the best advice I’ve received was: “Constantly ask questions to the point where it feels like you’re being annoying. If you don’t think you are being annoying, then you’re not asking enough questions.” Now, obviously know your audience on this and don’t just ask questions for the sake of asking questions. Questions inform our understanding. If you don’t ask a question as soon as it comes up, you forget it and have to double back later. Some other benefits of asking questions are that you may be asking a question that other people are unclear on as well, so by asking it, you are facilitating deeper understanding for the team. I cannot emphasize enough the importance of asking questions. If we don’t have clarity early on in the process, then its harder to be productive and successful later on. Some of the most important learning happens right after you leave the meeting and you are reflecting on the takeaways. Before leaving meetings, I’ve gotten in the habit of saying: “Before we take off, I just want to make sure I am clear on the objectives” and I will re-state in summary form everything that I will be responsible for in the project. Sometimes, if I need additional clarity, I try to send a follow-up email just to make sure that expectations are aligned and that my role in the project is clear. I have included a mock email to give you all an idea of what these types of emails look like. This is the final and most important step of the process. Once you have all of your questions answered and you’ve gained clarity on the project, you should create a scoping document which includes the project’s objective, components, expected deliverables, and dates. This will serve as your team’s centralized resource of information. While it sounds tedious to create now, it will be your best friend in the future. Why, you might ask? Because it will help you hold yourself and stakeholders accountable for the work that needs to get done. Projects can get really messy, dates can change, some deliverables can get pushed back—that’s all apart of business. The sooner you can adapt to these changes, the better. If you have a centralized document to pull from, you will always know what is expected of you, and the date that it is expected by. If stakeholders get a bit greedy, and ask you to do more work than what was originally agreed upon or that you have time for, you can refer back to the document and politely say, “Sorry, but this was not in our agreed upon scope and I cannot dedicate more time beyond this." It is a great way to protect yourself, your time, and your work. These three tips have transformed my organizational approach to work. By using them, I have found that I am more productive and have a much deeper understanding of the impact that my work has on the organization. I also have found that these three tips have given me more credibility and have also improved my working relationships with stakeholders, which are great for building a solid professional brand. I hope these tips are helpful to you as well.